Nura is a fabulous boat for day cruises to the wonderful Calas of Menorca. From its berth in Cala Llonga, near the exit of the Port of Mahon (the largest natural harbor in Europe) you'll reach nice beaches in a short cruise. The circumnavigation of the island is theoretically possible in 4 hours. The consumption amounts to only about 275l diesel so apporx. 60 liters per hour. Of course, one should take a week to circumnavigate Menorca and as spend a night each in the great marinas of Ciutadella, Fornells and Mahon. For the remaining nights you have the choice of the many beautiful bays of Menorca. Did you know, that Menorca has a lot more of those than Mallorca? Nura is very well laid out for its total length of about 12m and very comfortable to cruise with with 6-8 people. The vessel is registered for a maximum of 12 passangers. 5 people will comfortably sleep on the boat sharing a bathroom with shower and an electric toilet. The boat sits comfortably in the water and rocks comparatively less than other boats of this size. 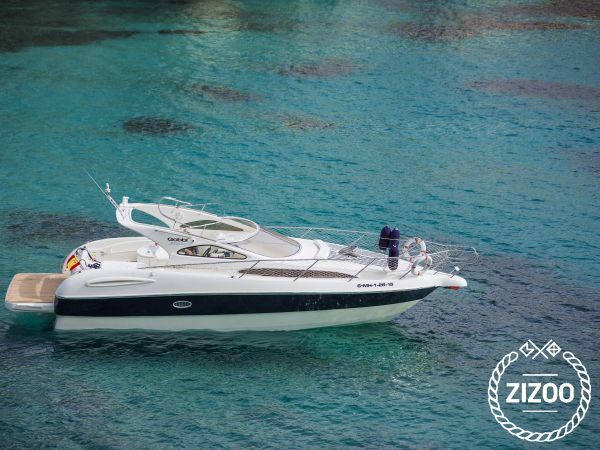 We have bought the boat in October 2015 and extensively renovated in the winter. New elements include the big teak swim platform, hull color blue, bow thruster, electric. WC + tank, electrics incl. new batteries and smart charger, refrigerator, navigation electronics (including Raymarine Es Series with Navionics Platinum charts), tender boat with 4-stroke outboard + submergeable radios, carpets and upholstery in the interior, exterior upholstery, bedding, kitchen equipment, music system with Wifi / Bluetooth streaming, complementary iPad with free Internet access. Of course you will find recent bay- and port guides of Menorca and Mallorca on board. Safety features include a new radio with DSC and / distress transmit button, lifejackets in all sizes (for toddlers automatic vest), a MOB lifeline, tender lifeboat, large medicine chest / first aid, 5 fire extinguishers, pyrotechnics, safe, and many others. Requested 30 times this week!